Founded in 1987, Bravo! Vail is a feast for all of the senses. Hailed as one of the Top 10 “Can’t Miss” Classical Musical Festivals in the US by NPR, Bravo! 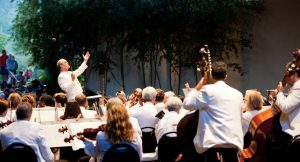 Vail is the only Festival in North America to host four world-renowned orchestras in a single season. Enjoy extraordinary music in the company of great friends surrounded by the natural beauty of the Vail Valley, especially of the Gore Range, visible from the famous Gerald R. Ford Amphitheater. In 2016, the New York Philharmonic, the Philadelphia Orchestra, the Dallas Symphony Orchestra, and the Academy of St Martin in the Fields featured programs of the great classics, plus jazz and pops. International Dance The splendor of the Rocky Mountains is the perfect backdrop for the artistic brilliance you can enjoy every summer as Vail hosts some of the world’s finest international dancers. Now in its 29th year, the Vail Dance Festival has developed into a treasured celebration of dance, renowned for its artistic excellence and unparalleled programming. Thousands flock to Vail each summer during the festival’s two-week residency, transforming the Village into a culturally-rich environment that is inviting to dance aficionados and newcomers alike.